That title is far more scandalous than the contents of this article, I assure you. One teeny-tiny project at a time, this new (old) house of ours is slowly but surely coming together. 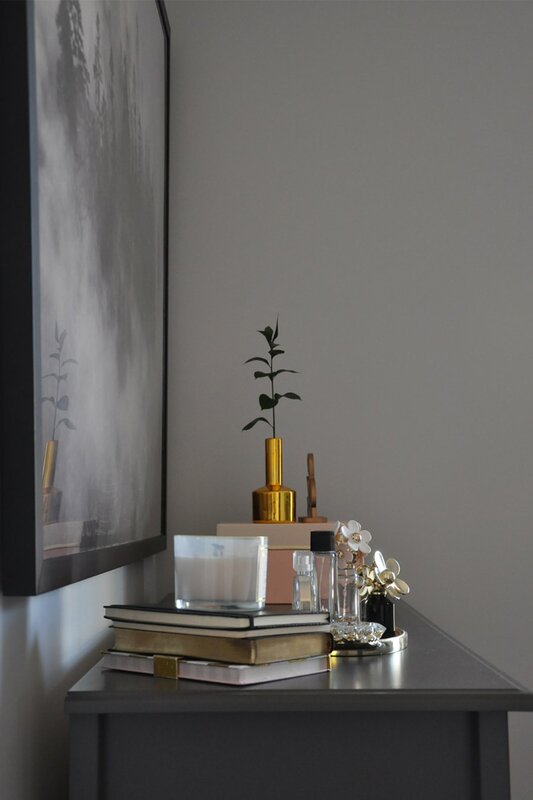 Certain projects (like installing AC vents) may not be as exciting as others (like choosing artwork for the bedroom), but every little step is satisfying, and we're enjoying the process of making the house our home. When it comes to decorating, artwork is something most people leave until the end – and we're no different. Art requires a certain commitment, so it's no surprise that choosing how to address the empty walls in a room overwhelms most people with anxiety. Does this piece go with that one? Should the frames match? Does this piece fit the overall aesthetic of the room? What size do I need? Does it set the right mood? When time came to choose artwork for our master bedroom, I was asking myself many of the same questions. 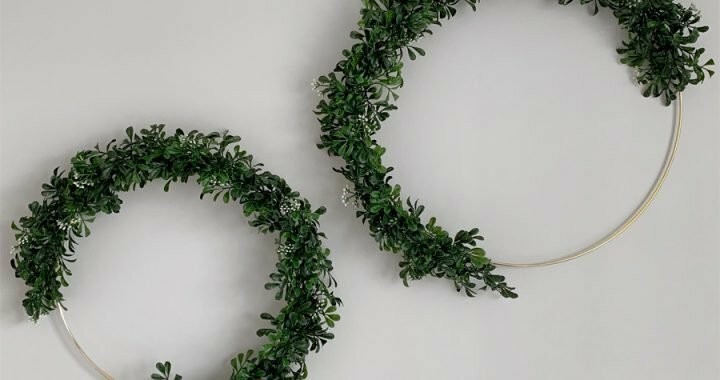 To complicate matters even further, we were facing a particularly annoying design dilemma – one I've oh-so-lovingly nicknames "The D.E.B.," or the Diabolical Electrical Box. No offense to anyone named Deborah. Back when the entire house floorplan was being completely re-configured, someone had the bright idea to place a giant electrical box in the corner of the only bedroom wall that could accommodate the length of a dresser. 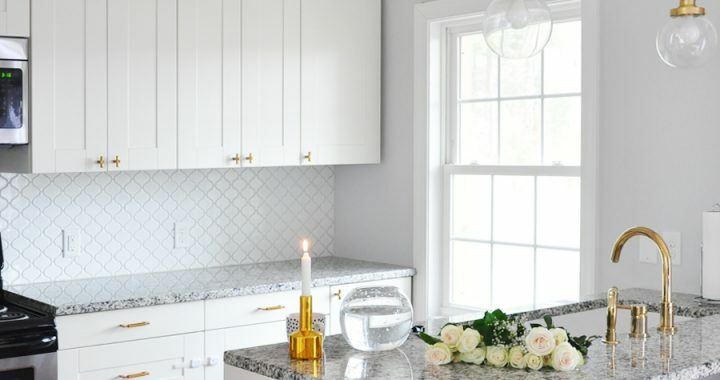 I like to pretend that this mistake was made because no one asked for my opinion, but the truth is that when you’re in the midst of a full-house renovation with zero experience and pressing deadlines, mistakes are made – and often. In fact, you can read about our many, many mistakes in two posts appropriate titled, "My Biggest Renovation Regrets, Part I" and "My Biggest Renovation Regrets, Part II." Returning to the issue at hand, the decision to install The D.E.B. in that particular spot completely shattered my dream of hanging (yet another) round, brass mirror above the dresser. It's probably for the best, considering I already installed that mirror on the fireplace and in the entryway. 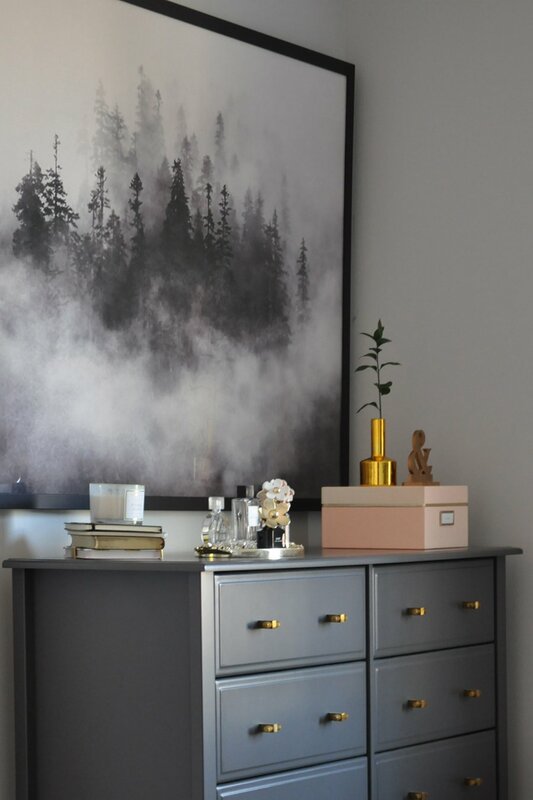 Needless to say, I've spent five months in search of the perfect solution above the dresser – when I happened upon Minted.com and their 40x54" artwork collection. I immediately knew it was fate, because the wall space I was looking to cover was 40x55". Why not opt for a mirror instead, you may be wondering? For starters, the 40x55" mirrors I considered were ridiculously expensive! Furthermore, did I really want such a massive mirror to reflect my messy bedhead every morning? Also, not that I'm a big proponent of feng shui, but apparently mirrors in the bedroom are a big no-no. I tend to over-research every detail of the decorating process and came across this somewhat questionable piece of advice in one late-night research sessions (AKA downward spiral into the bottomless abyss otherwise known as Pinterest). Truly, though, even before this knowledge was brought to my attention, there was something about having such a gigantic mirror in a fairly small bedroom that just felt...strange – almost like we were so narcissistic that we couldn't take the two steps into the master bathroom, where there were not one, but two mirrors! By the way, if you're tiring of reading the rationale behind my decisions, you can always skip to the pretty photos. But I hope that explaining my reasoning behind my design process will help someone else identify what works in their space and what doesn't. Moving on, why did I choose this piece? After weeks of perusing Minted.com, I narrowed my selection down to the following pieces, in no particular order. Color: It fits the overall color scheme of the room. Aesthetic: It has clean lines that appeal to my perfectionism, yet it's interesting enough to make a statement. 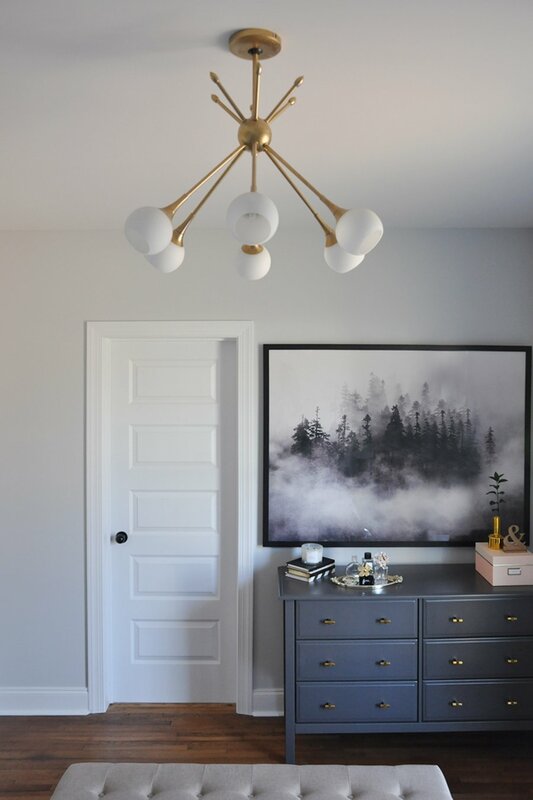 This little bedroom of ours still needs some love, but overall we are loving the mood of this space. The statement artwork emits such a calming yet simultaneously turbulent feeling, which is only punctuated by dimmed lights. Now, I'd love to hear from you: How do you choose art for your home? Are you a fan of mirrors in the bedroom? Which of our six favorite pieces would you have chosen? 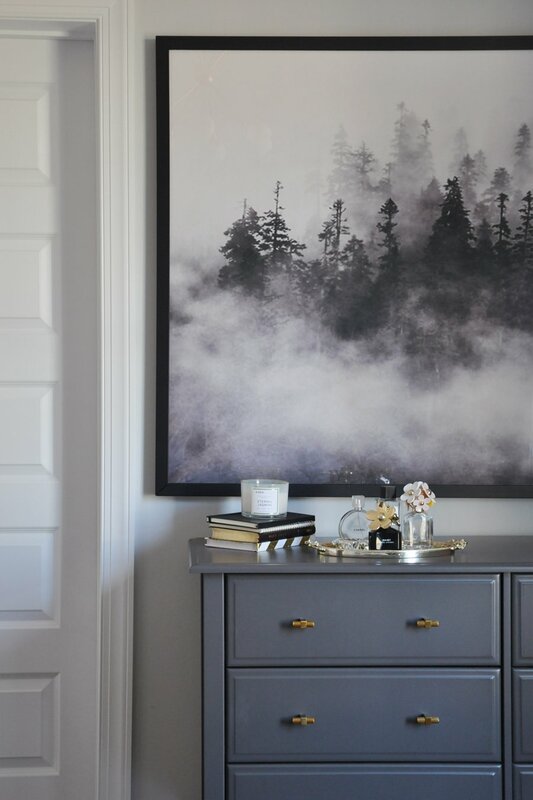 This post is brought to you in collaboration with Minted, who very generously gifted us "Lost in the Fog" artwork. Thanks so much for supporting the companies that allow me to create unique content while featuring brands and products I truly use and love. 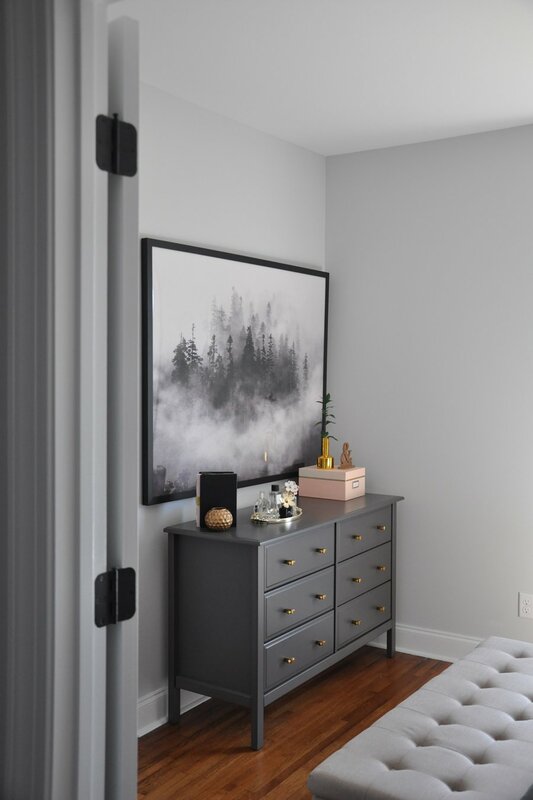 Posted in HOME DECOR, OUR BUNGALOW RENOVATION and tagged MASTER BEDROOM, WALL ART. 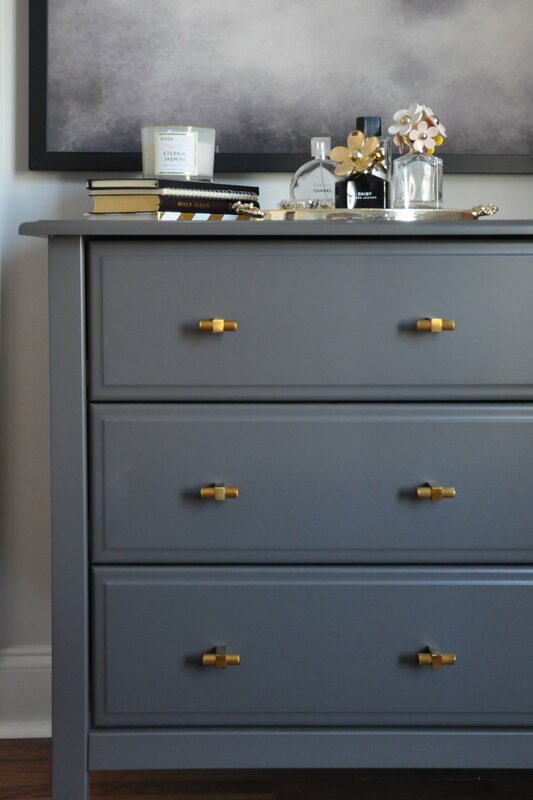 Such a gorgeous painting and you’ve paired it with beautiful accessories and decor! It looks great! You did an amazing job! 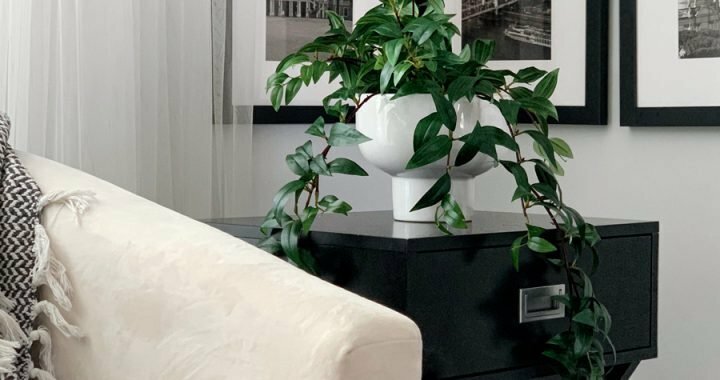 You did such a beautiful job furnishing your home! You did an amazing job! It looks so good!! I love the art you chose! I have an outdoorsy-themed gallery wall with a similar print. Such a great fix! Also, love that art piece. I love Minted! 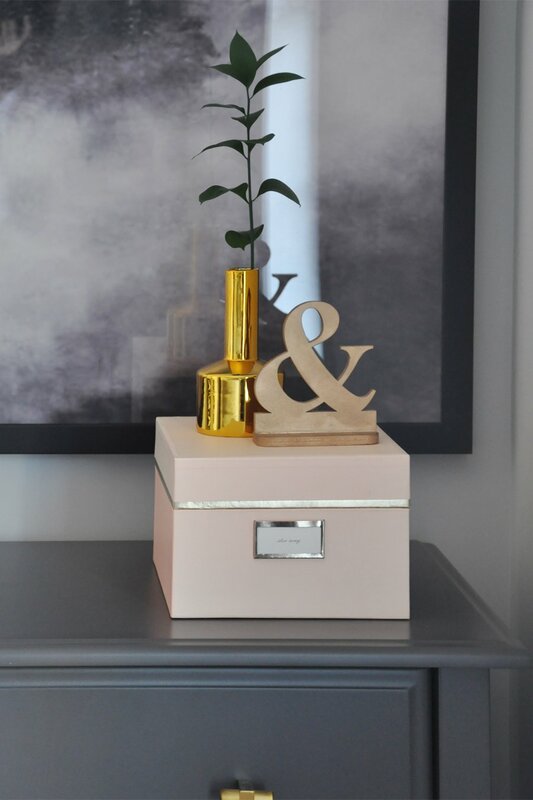 The little details in this room are just darling! 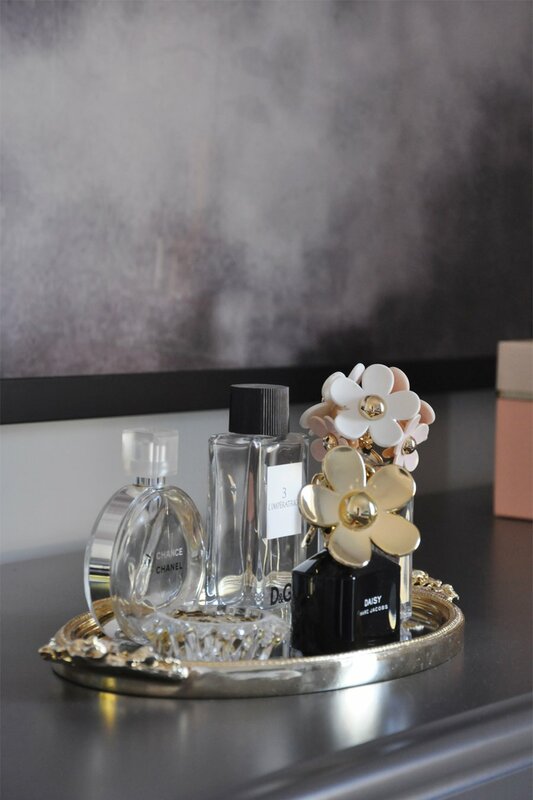 You have great taste when it comes to decorating. 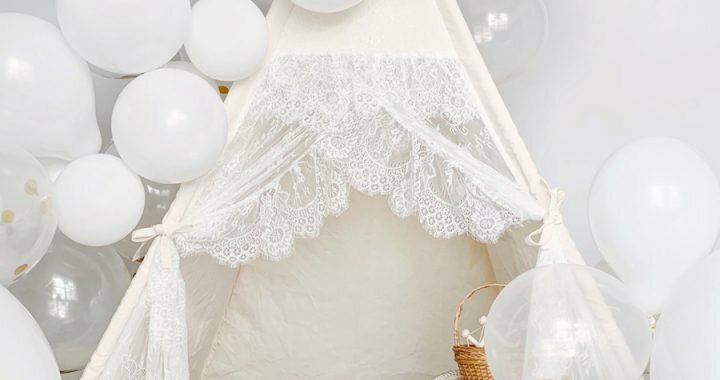 Minted has such cute stuff! Love how it turned out. uhm .. can i just say GOALS!!! you have such an eye for detail. im obsessed! so gorgeous, great job! How elegant is that artwork! Truly makes this room come together. “No offense to anyone named Deb” omg too funny! 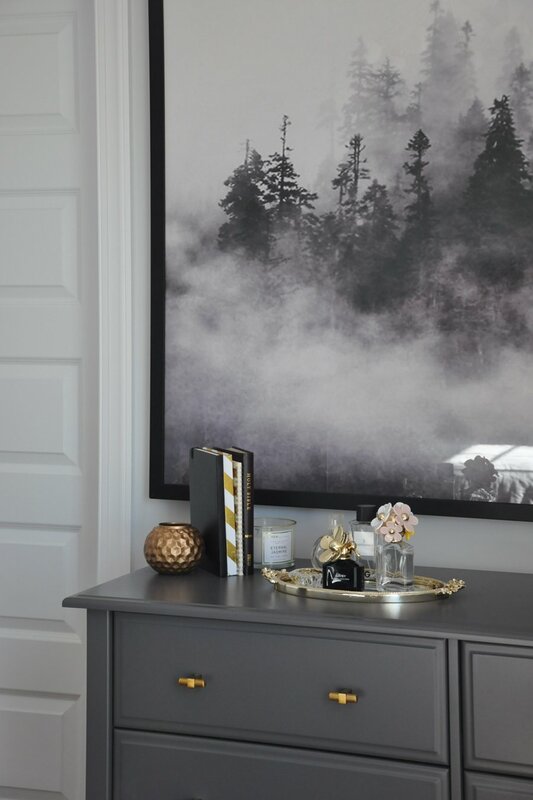 Your bedroom looks so nice – glad you went with the Lost In The Fog painting! You did an amazing job! It looks incredible!